It can be instantiated using any enum (or C++11 strongly-typed enum) value; the most common expected use scenario has iterators emitted by EnumRange and WholeEnum via standard begin() and end() calls. 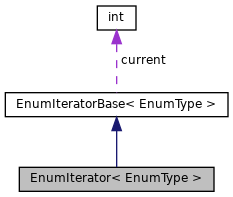 In order for the iterator to work, it is mandatory that the underlying enum type's representation values be sequential. The iterator does not check for bounds when incrementing or decrementing, that responsibility is left to the caller. Definition at line 65 of file EnumIterator.h. Definition at line 29 of file EnumIterator.h. Definition at line 68 of file EnumIterator.h. Definition at line 39 of file EnumIterator.h. Definition at line 43 of file EnumIterator.h. Definition at line 70 of file EnumIterator.h. Definition at line 75 of file EnumIterator.h. Definition at line 81 of file EnumIterator.h. Definition at line 86 of file EnumIterator.h. Definition at line 35 of file EnumIterator.h. Definition at line 47 of file EnumIterator.h. Referenced by EnumIteratorBase< EnumType >::operator!=(), EnumIteratorBase< EnumType >::operator*(), and EnumIteratorBase< EnumType >::operator==().